What does S-Deco mean? Heck if I know. Seems like you can dig up as many theories on the background of this pickup as who was on the Grassy Knoll. Does it matter? We’re here to talk about how things sound, aren’t we? You betcha! The nice people from the Seymour Duncan company recently came back out of hyperspace in to my quadrant and I thought it’d be nice to grant permission to dock. I’d been exposed to the brand since…. well, let’s not get into how many decades that’s been… but I think it’s safe to say it was the era of mousse abuse and parachute pants. And I do like me some of MJ’s Custom Shop pickups… and tortillas…. and tamales… and, what was I talking about?!? So let’s get back to the S-Deco humbucker. You can get the S-Deco in a bridge or a neck model. 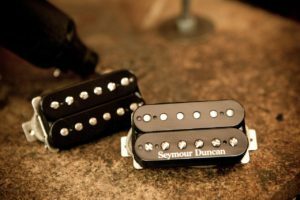 Outside of that, it may be one of the more versatile humbucker options that bears witness to Seymour’s name. First, in that you choose the magnet you want. Fret not (ha! a pun! ), MJ will get you where you need to be if you are not comfortable with determining specifications. I went with Alnico 2, Alnico 4, Alnico 5, and I have talked to others that have used Alnico 8 and Ceramic magnets. Outside of that, the S-Deco is a very well-voiced humbucker with an output in the hot-vintage range. This is where you’re thinking that could be said about other pickups, so what makes the S-Deco special? The skill of an artisan. In a time when big name companies can load a coil on a machine to have a program guide the wire, the nuance of human hands laying the wire allows for the magic to happen. No reason to overthink it. It’s that simple. I loaded a full S-Deco set into a double-hum alder 2010 MIJ Charvel Pro-Mod San Dimas with a quartersawn maple neck, maple board and a double-locking trem. There is an Alnico 2 loaded S-Deco in the bridge and an Alnico 4 in the neck. The neck is wired to a 500k push/pull pot for series/parallel. Then I put another S-Deco bridge, this one with an Alnico 5, installed in a northern hard ash body ESP super-strat, wired only for series. All are direct mounted. The S-Deco A2/A4 set is an excellent pairing for that San Dimas. Between the voicing and being wound to a moderate resistance and the selection of magnets, the set is as vital for clean amp settings as for dirty. Put the neck on a parallel option and cleans are shimmery, while dirty tones are snappy. The even character of the neck pickup rounds out the overall voice in so much as it’s great for lead work, while keeping the low end under control. The bridge pickup has a nice mid-range growl that compliments an exceptional edgy quality (for an Alnico 2!) in the highs and a low end that is both a smidge spongey and still punchy. The middle position is great for slightly mellow vintage rock tones. The A5 bridge in the ESP has a bit more of an aggressive attitude that’s just as ready to shank you in the parking lot after the gig. A little more precise in the lows and definitely more focused in the highs. Where the A2 bridge is inviting to clean amp settings, the A5 is going to push the cleans much closer to breaking up. This would be great if you’re putting your signal through a lot of processing or if you’re using a vintage amp for hard rock. The specs are so close it really doesn’t matter, but the A2 actually has just the slightest bit more resistance. Speaking of resistance, for something to clocks in at the 11-12k range, the S-Deco has a voicing that projects a much more lively presence that comes off as feeling louder. How does that grab ya? So go drop a line to MJ and get one… or a full set (tell her I sent you!). Before you start in… yeah, I know, it doesn’t show up on the Custom Shop website these days – what’s up with that? Just drop her an e-mail or call her or if you’re feeling froggy maybe you can select the Build Your Own option (making use of the “Notes” section, of course).